Chicago Review Press, 9781569766248, 352pp. What is it like to be a young mother threatened with deportation to the country whose government has imprisoned you and whose soldiers have raped and tortured you? You don’t want to leave your children behind, but how can you take them with you, knowing that your homeland, ruled by chaos and violence, is notorious for murdering failed asylum seekers? Regina Bakala found herself in just this situation ten years after escaping the Congo and settling in the United States. Upon arrival, Regina had worked with an immigration lawyer, then joyfully reunited with her husband, also a Congolese torture survivor, and had two children. Life was challenging but full of hope until the night there was a knock at the door and immigration agents burst in. They forced Regina from her home as her family watched, then locked her in prison to await deportation to certain death. 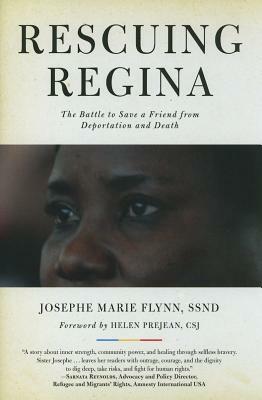 In Rescuing Regina, author Josephe Marie Flynn tells Regina’s powerful story—and how her husband, a pit-bull lawyer, a group of volunteers, and a feisty nun set aside political differences to galvanize a movement to save her. Revealing what she uncovered about US immigration policies and the dangers faced by those escaping war crimes, Flynn exposes an America most never see: a vast underbelly of injustice, a harsh detention and deportation system, and a frighteningly arbitrary asylum process. In their battle for justice, Regina and Josephe not only confronted dangerous obstacles but also reawakened emotions and traumas from the past. A compelling story of a quest for justice, Rescuing Regina is also a tale of friendship, faith, hope, and the transformative journey of two friends. Leader of the Save Regina Campaign, Sister Josephe Marie Flynn is cofounder and chair of the Milwaukee Archdiocesan Justice for Immigrants Committee and a member of the Global Justice and Peace Commission of the School Sisters of Notre Dame. A retired teacher, she lives in Milwaukee, where she is a spiritual director and an advocate for immigration reform. Sister Helen Prejean is the author of Dead Man Walking. A sister of the Congregation of St. Joseph, she counsels death row inmates and families of murder victims.